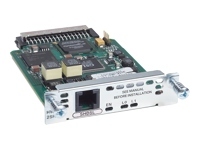 The 2-pair symmetric high-bit-rate DSL high-speed WAN interface card (HWIC) provides G.SHDSL connectivity to a Wide Area Network. The 2-pair G.SHDSL HWIC provides two ports of 2-wire or one port of 4-wire connectivity options. This card is supported in all integrated services routers that have HWIC slots.